Dorothea Montalvo Puente was still planting her victims around the yard of her Sacramento Victorian home when she first sidled up to reporter Dan Blackburn, initiating an acquaintanceship that would eventually provide rare and perceptive insight into the mind of a female serial killer. Puente’s sordid story is related by Blackburn in “Human Harvest: The Sacramento Murder Story,” updated to incorporate the results of her trial, as well as subsequent Congressional actions intended to correct fatal flaws in the Social Security system. “Human Harvest” is now available in eBook format (epub, pdf, mobl) from more than 60 “etailers” including Amazon; independent bookstores nationwide; and public and university libraries via 3M Library Services and Overdrive. New Orleans publisher G.K. Darby of Garrett County Press said the Kindle Edition of “Human Harvest” offers a discerning view of gaping loopholes existing in Social Security law, only some of which were corrected during a marathon 13-year effort by Congress to make appropriate fixes. Even after the first body was unearthed from under Puente’s well-manicured lawn in Nov. 11, 1988, she was allowed by police to leave her property; she then fled. Eventually, eight more bodies were discovered, in the yard and elsewhere. Puente was captured in Los Angeles after five days on the run, and returned to the Capital City to face trial. Her conviction on three murder charges in August 1993 sent her to prison for the rest of her life. Blackburn, a lifelong journalist and co-founder and senior correspondent of CalCoastNews.com., is the only reporter to communicate regularly with Puente after her arrest and eventual incarceration. Puente died this year. 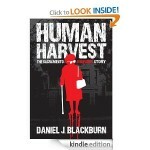 “Human Harvest,” a national best-seller, was a Literary Guild Book-of-the-Month and Mystery Book Club selection. What would be great is if Dan wrote a novel about a crime that occurred here in our neck of the woods. I’m thinking about something recent that was utterly shocking and bewildering. ie: Destiny Meyers. That would be a fascinating book especially since the perps all plead out and we never got to the bottom of why they did it or what the mentality was at work behind these “so-called people”. Who are these maniac’s? Especially Rhonda Wisto, who is this woman and mother who would allow such a heinous and torturous murder to be inflicted on a 15 year old little girl? Not to mention that she destroyed her own son’s life after insisting that he participate. Who in the world is she and what was she thinking, what is she thinking now? Write the book Dan, you have access right here in our back yard. I bought the ebook yesterday morning after I read the article about it. This is a book I would highly recommend. It is truly a page-turner, and a I really am sorry I didn’t start reading it immediately after I bought it, but waited until I went to bed. I’m paying for it today, as I was up way past my bedtime before I forced myself to put it down. I think anyone who likes true-crime books will love Dan’s book. He brings a slightly sardonic approach to his writing style (see the quote, above) which just makes it more beguiling. Hope to have time to finish it today. It’s only $2.99 which is, IMO, a real steal. I lived in Downtown Sac then, and this crime was quite an interesting spectacle. Did she ever admit that she had killed these people? She did not. To the end, Dorothea would respond in a little-girl voice that “I wouldn’t do that… these were my friends.” I also think (perhaps) some of the nine people did die of natural causes; most of her residential clients were physically frail. But she buried or disposed of all because she had established an irreversible pattern with the first. I was struck by the similarity in background that Dorothea Puente had with Scott Peterson’s mother, Jackie Peterson. They both spent time in orphanages in Southern California, and they both had two children at an early age and gave them away, and never looked back. They were both dependent on other people for their survival, and neither had any compassion or humanity–true sociopaths. Somehow Scott Peterson through heredity or environment had this same deficiency. Did any of Dorothea Puente’s relatives ever show up or visit once she was incarcerated? Guess I’m going to have to read it. I’m familiar with the story to the extent that I saw the made for TV version but what makes true crime fascinating is when the author actually has the up close relationship with villain as to provide factual insight into the who they are and the why. Sure I know why she did it, but…….why? Most of us as in 99.9% of us could never murder and bury an innocent person in our yard for their SS check, let alone 8. Dan also has extras that I’ve never seen in a true-crime book before. If you are a crime-records junkie like I am, you will love this extensive list of compelling, insightful extras. ****Parole-Probation Report from the Department of Corrections. ***Complete Sacramento P.D.’s summary of the initial interview with Dorothea, for 11/11/88. ***Excerpts of testimony at the trial, some verbatim, and excerpts of coroner reports…. SEQUENCE OF EVENTS: This timeline is great. I can’t remember seeing a timeline in a true-crime book before. Because of Dorothea’s extensive criminal history, the timeline will help reorient the reader after picking up the book after not reading it for a day or so. EXCERPT OF CORONOER’s REPORT ON ALVARO MONTOYA. If you like reviewing the medical evidence, like I do, you will love this. By leaving the info about the “extras” from the review, I think CCN doesn’t do just to the book justice. This is a comprehensive true-crime fan’s book which will provide a much fuller picture, thanks to the extras provided.